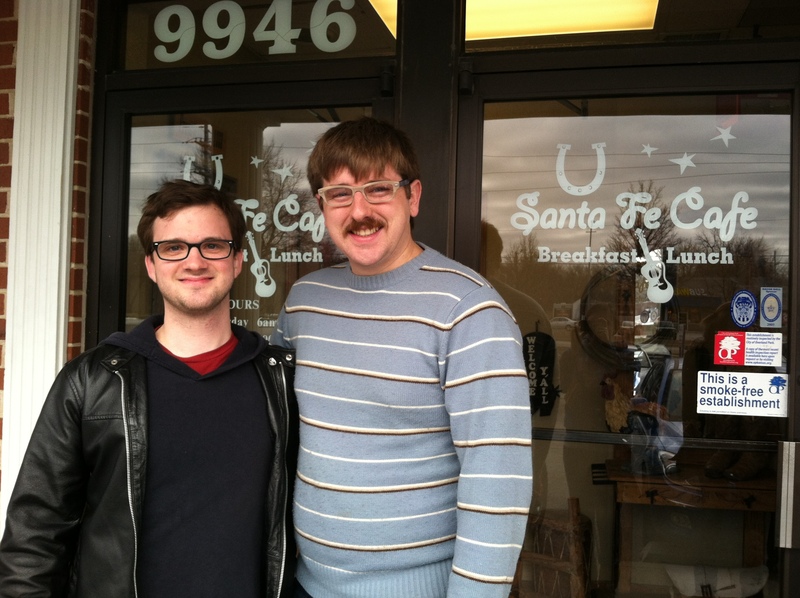 February 2, 2013 – 10:40 A.M.
Santa Fe Cafe is a cute hole-in-the-wall bruncherie at 9946 W. 87th Street in Overland Park, KS 66212. 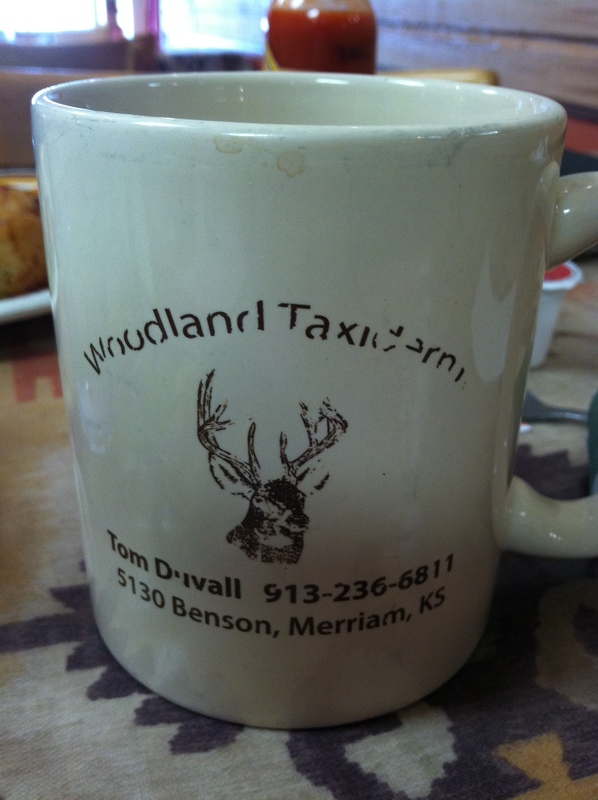 This first and only local favorite serves breakfast and lunch daily. They have a Facebook page, but no Twitter to our knowledge. More info can be found on their website. Location/Environment: Located in a strip mall off 87th street, Santa Fe Cafe is a southwestern-themed restaurant, all the way down to the paintings and table decor. The vibe is friendly and inviting, but might be a tad loud for more intimate occasions. Our particular visit was quite busy, but that didn’t seem to hurt the service too much (see below). Some might describe the environment as homestyle, and we’d say that’s to its advantage. Just as if you were at grandma’s house eating pancakes, they feature unique mugs. We don’t think they’re stolen. Service: The service was overall quick and efficient. Our server seemed a bit anxious to take our order right as we sat down. She wanted to help but perhaps a bit too overzealous. She seemed eager to turn the table, but this isn’t a downright negative. Fast, attentive service can obviously be a plus too. She did offer some food recommendations, which is always welcome. Menu/Selection: The menu offers what you’d expect from a joint that serves breakfast, lunch and between. From flapjacks and french toast hot off the griddle, to salads and sandwiches, there’s probably something that is an answer to your current hankerings. If you take a quick look at these pancakes you might think these are just plain buttermilk pancakes. You are wrong! These are blueberry pancakes. 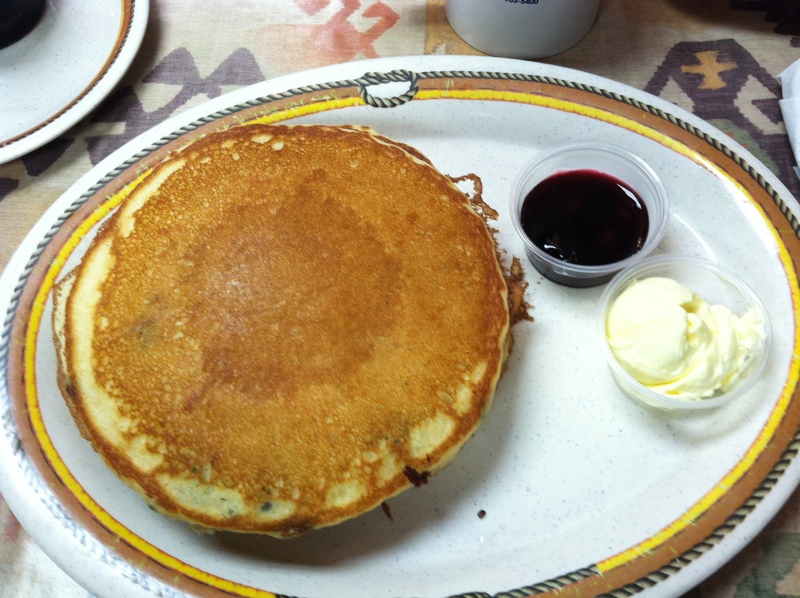 They have full blueberries that were dropped in the pancakes while they were being griddled. Yeah, griddled, that’s a thing. I enjoyed these pancakes very much. I appreciate when a restaurant puts real ingredients in the pancakes instead of just throwing a blueberry compote on them and calling them blueberry pancakes. That is cheating. I am also happy that due to their copious amounts of butter they give it to you in a small container. The maple syrup is a great complement to the natural sugars in the blueberries. These pancakes were very moist. I really enjoyed how they fell apart so easily. I enjoyed the western plates in an ironic way, like I would have them in my house and call myself Woody. I think I could pull that off. 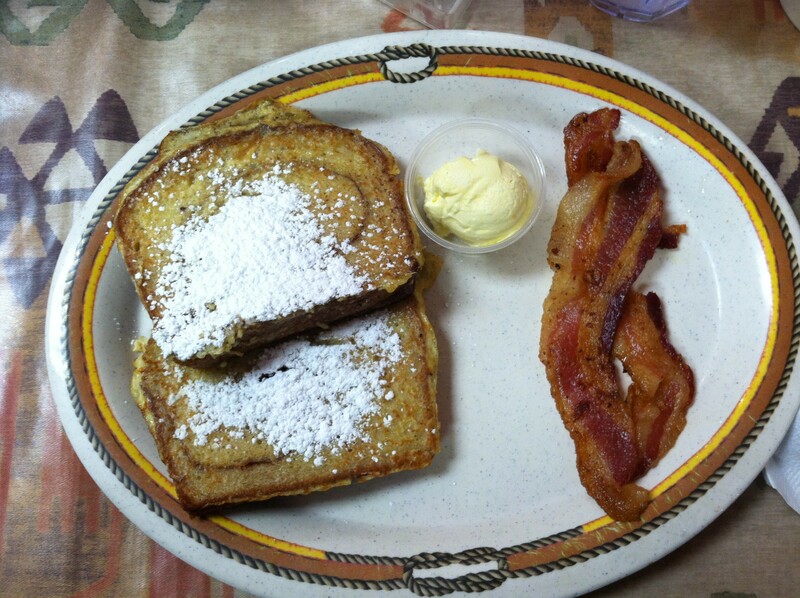 I was ready to pounce on some classic french toast when the server suggested I try some on their cinnamon swirl bread. I always appreciate a secret suggestion. Secret eating is my favorite. Upon receiving my meal, it was clear I made the right decision. Two, thick and fluffy slices of cinnamon swirl bread, french toasted and coated with a healthy dusting of powdered sugar. The pieces were still warm and moist. I always love a nice serving of butter, even if my thighs hate me later! Under an appropriate thin coating of hot maple syrup, the cinnamon complimented the powdered sugar and butter quite well. It would have been a treat without syrup at all. While all sweet, it wasn’t too overwhelming. The bacon was meh, but bacon and I have a tumultuous relationship to begin with. The portions aren’t huge and the plating wasn’t great, but that’s not really what you expect from a place like Santa Fe Cafe. Price: Pricing is incredibly standard within the industry. They do offer a frequent eater card. It is pretty limited though. It is one person per card so you can not put yours and your partner’s meals on one card. That is pretty lame. Overall: Santa Fe Cafe was just fine. They tried terribly hard to be western. It did not make a huge impact on either of us.